Learn the simple secret to making the most vibrant condiments in your fridge! I’m going to teach you everything I know about 2-ingredient quick-pickled veggies! I get it–my eyes always jump to pink things too! When I started my whole food, plant-based, nutritarian journey I really wanted to make pretty food because (and I’ve said this before) I have a serious case of eat-with-my-eyes-itis. In 2014, I was lucky enough to come across an amazing vegan account on Instagram called Stuff On Toast (who I’ve followed ever since). Stuff On Toast taught me this super-simple method for creating the most gorgeous quick-pickled veggies, right in your fridge, and I’m eternally grateful! After some tinkering and experimenting I found out that you don’t need to add any salt, sugar, spices or herbs to make an incredible-tasting condiment! And that’s when the obsession became something I make every. single. week. as part of my weekly batch prepping program. Now I’m sharing these gems with you too! I have a printable guide for you at the bottom of the post–but this isn’t like a traditional recipe at all. These refrigerator pickles are not picky. You can literally make these in anything you have as long as the vessel has a tight-fitting lid. Plastic containers, glass snap-lock containers, even washed-out hummus or miso paste tubs! What can I say? Wide-mouth Mason jars are a girls’ best friend, especially for these refrigerator pickles! So, grab what your container and let’s get going! Vinegar does ALL the magic here. I recommend you use white vinegar because it has no additional flavor like an apple cider, balsamic or red wine variety would. Rice vinegar would be my second recommendation if you don’t have white. It’s astonishing to me that adding this one simple ingredient to chopped veggies can absolutely transform them. 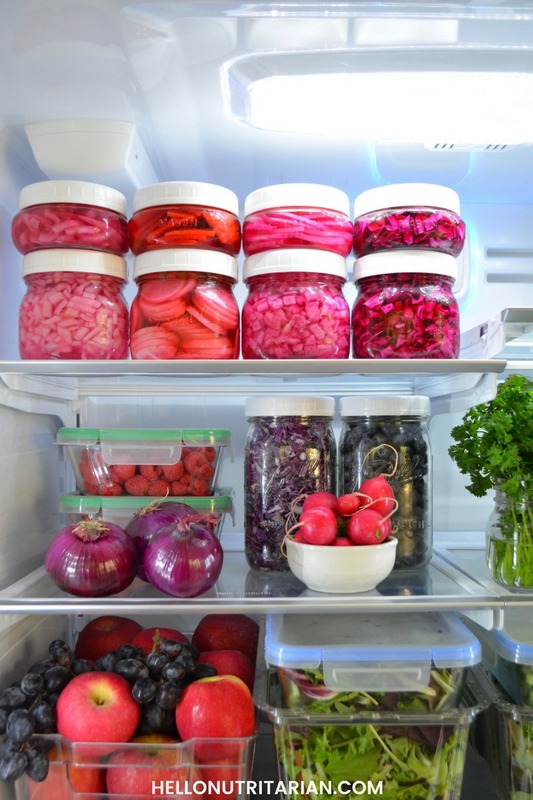 You’re going to chop up red onion, red cabbage or radishes, fill them in your vessel, cover them with white vinegar, secure with that tight-fitting lid and let them hang out in the fridge. 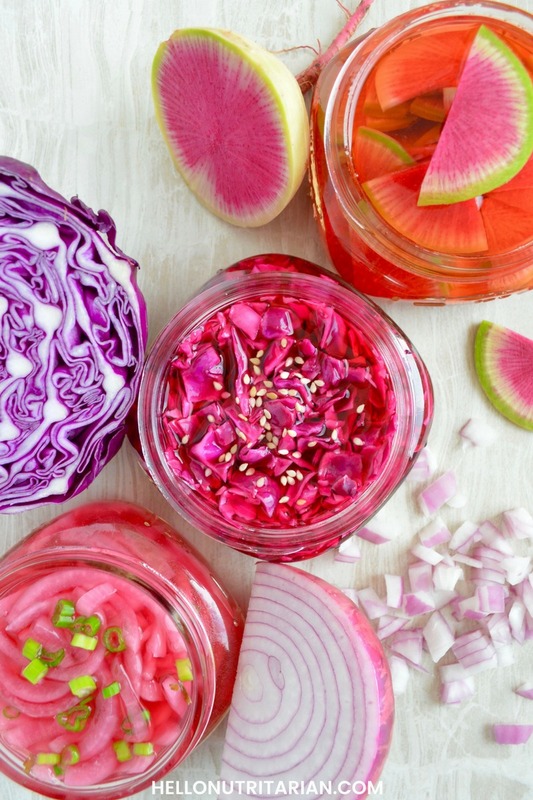 Above you’ll see pickled red onions in three different stages. I’ve sampled these refrigerator pickles at various stages but I prefer them after at least 3 days marination time. They can last for WEEKS in the fridge, getting better with time! As they marinate their taste changes, especially the onions. The onion flavor mellows considerably compared to a fresh-cut onion. That’s why my husband prefers these on his sandwiches at work (cause nobody likes onion-stink-breath at work meetings, amiright?). So, the peak window for your refrigerator pickles is: 3 days to 2 weeks. After 2 weeks the vinegar gets a bit cloudy (with the onions especially) and the veggies start to degrade a little bit too much for my liking. As your refrigerator pickles “marinate” they also change color. 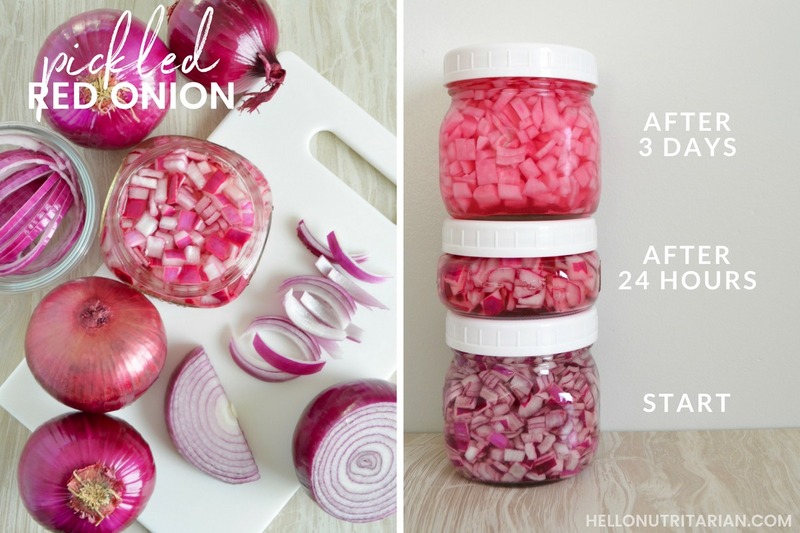 RED ONION: You’ll get varying levels of pink depending on how much pigment your onions have to begin with. Sometimes I get a very light-pink pickle and other times a very vibrant and saturated pink. Try to look for red onions with strong purple-colored outer layers. RED CABBAGE: Of all the veggies you can pickle red cabbage has the most consistent color results. Since every leaf is deeply pigmented, once they interact with the vinegar the color starts to immediately change from purple to a deep magenta. RADISHES: There are a lot of radish varieties, as you can see here. My favorite for pickling are the round, “Easter Egg” radishes you commonly find in the produce isle. 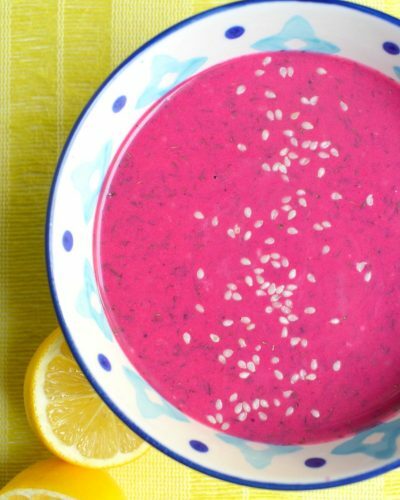 After marinating, the radishes lose the pigment from their skin and turn a bright pinkish-red. 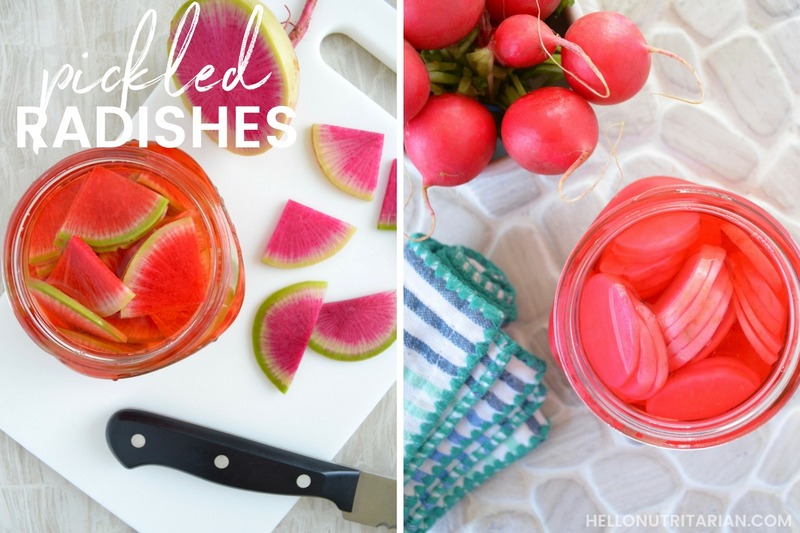 For this post, I experimented with pickling watermelon radishes you can see the results on the left in the picture above. I was rather disappointed that their lovely pink pigment turns red almost instantly after being exposed to the vinegar. They tasted great (much better than in their raw state) but considering their higher price tag I recommend sticking with the round radishes instead. Can we just stop for a sec and admire how gorgeous these pickles are? 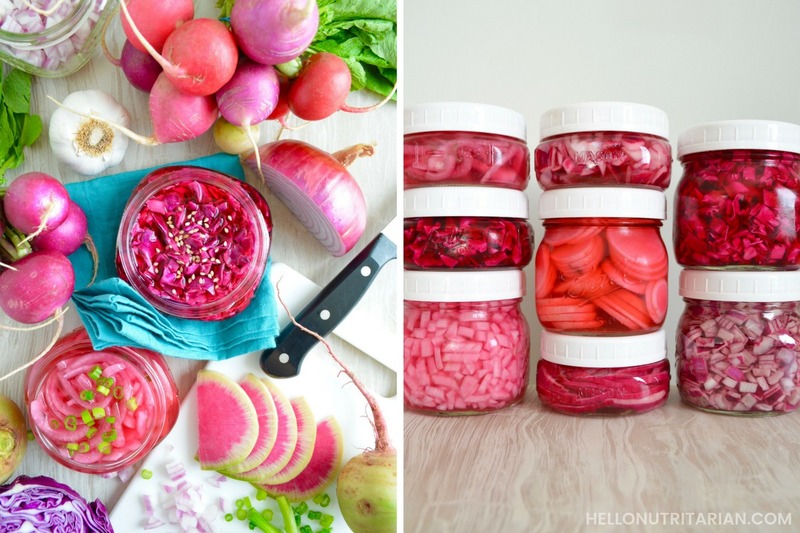 From left to right: pickled red onion (on the lighter-pink side), pickled radishes (watermelon radish on top), more pickled red onions (on the darker-pigmented side) and pickled red cabbage. TASTE: All varieties of these fridge pickles are tart. If you’re not a fan of the taste of vinegar then this is definitely not the condiment for you! 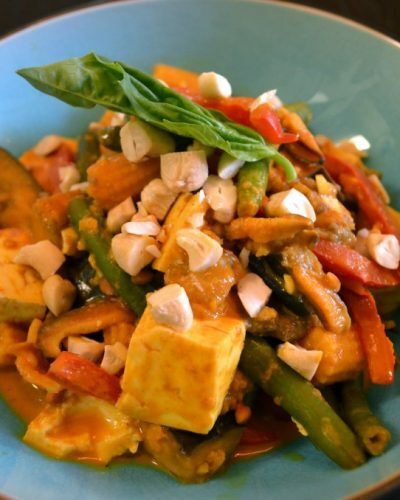 The veggies retain their crisp and crunchy texture and their natural flavors mellow out a bit. HERBS & SPICES: You can definitely add any herbs and spices you love and get creative with flavor combinations too! In my premium ebook I include spice and herb blends for refrigerator pickles that compliment the cuisine themes for each week. USES: My favorite way to use refrigerator pickles is on my salads! They add a lovely tart, brightness to the rest of the veggies in my bowl! Other ways to use them: in sandwiches, in pasta salad, on avocado toast, and as a pizza or flatbread topping! 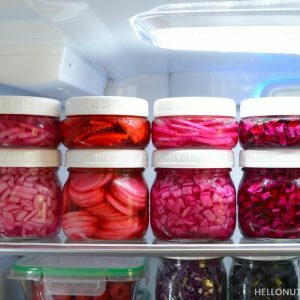 Learn a super-simple, no-cooking-required technique to making your own no-salt, no-sugar refrigerator pickles! Chop or dice your veggies into your desired shape. Fill your 16 oz. glass Mason jar (or other container) with the chopped veggies. Cover the veggies with white distilled vinegar. Add any spices or herbs, if desired. Secure the Mason jar tightly and place in refrigerator. All the veggies to marinate in the vinegar for at least 24 hours, but more preferably 3 days before first use. The pickled veggies will last in the fridge for at least 2 weeks and usually longer. 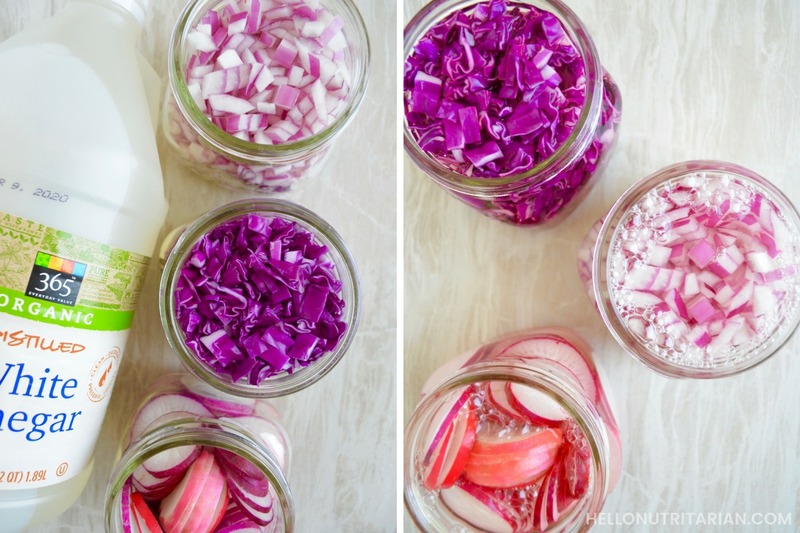 Red cabbage and radishes lasts the longest with minimal deterioration after the second week. These can be eaten at the 3 week mark. Red onions will start to get a little milky looking around the 2-week mark. Use on salads, sandwiches, flatbread and pizzas! I hope you enjoyed learning how to make one of my all-time-favorite nutritarian condiments! If you give this pickling technique a try, I’d love to hear what you think–please leave a rating and comment below! Do you do this with any other veggies? Maybe cucumbers, carrots, or jalapenos? I have done it with cucumbers but I used citrus juice instead of the vinegar! Yes, you can definitely use carrots and I’ve done them with jalapenos together like at taco places! So wonderful to meet you, Victoria! HUGE congratulations on starting your nutritarian journey!! Now that’s a serious case of serendipity–I love it! So happy you are working towards getting your GBOMBS met! 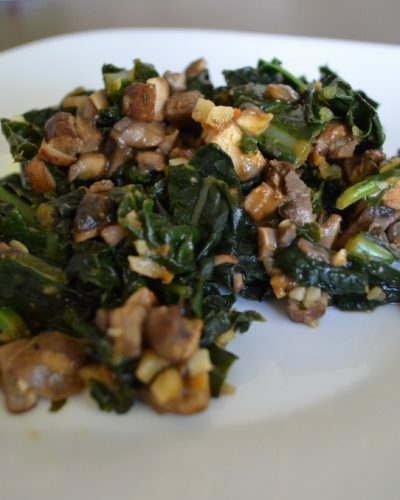 I’ve worked with a lot of readers who don’t like the taste or texture (or both) of mushrooms. I’ve tried blending mushrooms before when I was making a suce and it just results in a strange, kind of unstable texture. I definitely recommend roasting them int he oven with some balsamic vinegar instead. They will last for the week and you can “practice” eating one bite a day. This was the best advice I ever got from a doctor–literally bite and chew the veggie you don’t like and if you feel that you have to, spit it out. After repeated exposure your taste buds change! Please check in again on your journey! Wow, these look great, thanks Kristen. Will definitely give a try! 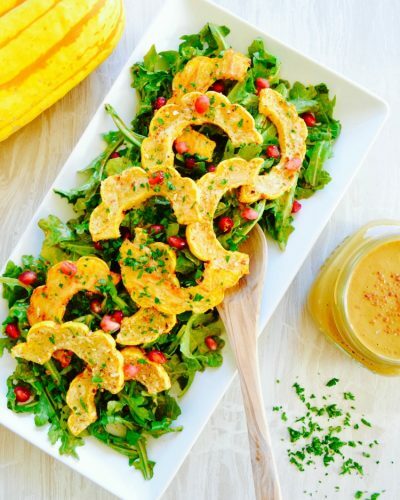 I love Dr Fuhrman’s work and your approach to making Nutritarian easy and delicious (and colourful). I recently interviewed him on my podcast Eternal Health too BTW, do check it out. So nice to meet you Laura! Thank you for your kind words! And how wonderful that you got to interview Dr. Fuhrman!! I will definitely check it out! So excited you’re going to give them a try, Merry! I think rice vinegar will work just fine! Can you use Apple cider vinegar? I haven’t used apple cider vinegar but I’m sure you can try it out. It definitely has a different flavor than white vinegar. If you give it a try please let me know how it turns out! This was the biggest salad game-changer I found after purchasing your prep book! I have tried the red onions (twice…. with a double batch), and I can’t wait to give the red cabbage and radishes a try in the coming weeks! Oh thank you so much for taking the time to leave such a lovely comment and review on the refrigerator veggies, Amy! Can this be done with lemons? Hi there! I’m not sure about substituting the lemon juice for the vinegar. It might work the best with red cabbage, because I’ve made coleslaw with citrus juice many times before. Let us know if you end up trying it! This looks like a great recipe! So simple and straight forward. Can’t wait to make some of my own quick pickled veggies for the family! Thanks so much! So happy to hear that you’re excited about it Billy! I make at least one batch weekly! I’ve never heard of white, distilled vinegar being a problem–from what I’ve read Dr. Fuhrman has never mentioned it. I personally have no problem with it and yes I use it quite frequently in my condiments! 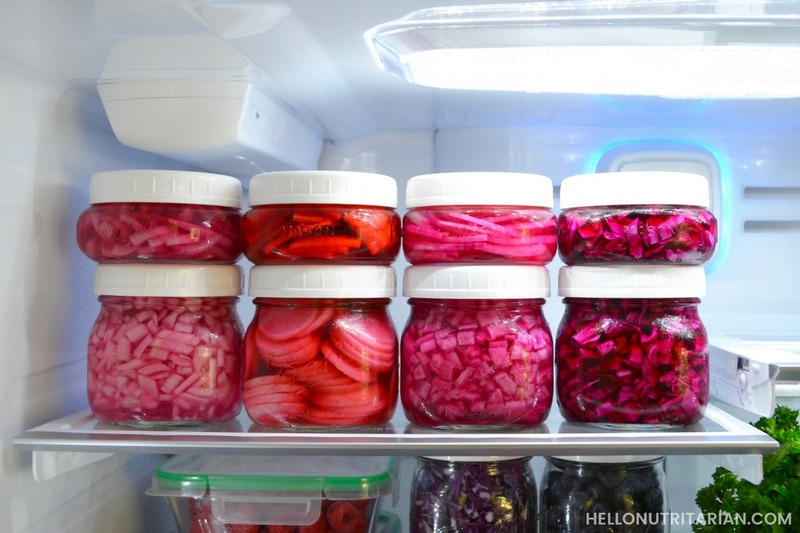 Thanks for sharing how easy it is to pickle foods! I’m diving deeper into fermenting this year and I always looked for special pickling recipes, but here we go, easy peasy! I did this with red onion and cabbage recently and enjoyed them both. I even caught my husband adding the pickled onion to his omnivore food. YAY!! So, so happy to hear that you and your hubby are loving these pickles! I agree, they are too easy and yummy not to make every week! Thanks so much for taking the time to leave a comment and review, much appreciated! I am so loving your blog. Your ideas, recipes, and comments are helping me transition to ETL. I am looking forward to the pickling part. What about beets? Can I pickle these? So, SO happy to hear that you’re finding the site a helpful resource on your journey!! Yes, you can pickle beets, I just started this myself! I just shred raw beets and follow the same process! O just made up three batches. 2 with red onion and one with redcabbage. I’m anxious to see how they turn out. Can you reuse the vinegar on additional batches! So wonderful to hear you’re trying out one of my all-time favorite recipes! I personally don’t use the leftover vinegar on other batches if it’s been longer than 3 weeks. Sometimes, with the onions especially, the vinegar can get cloudy. Can’t wait for you to try them out! My wife and I are using your recipes . We were wondering why you prefer garlic powder to fresh minced garlic. You can always sub garlic powder with minced fresh garlic if you prefer. I usually use powder because it’s faster and more people have it on hand! So happy to hear you and your wife are enjoying the resources!